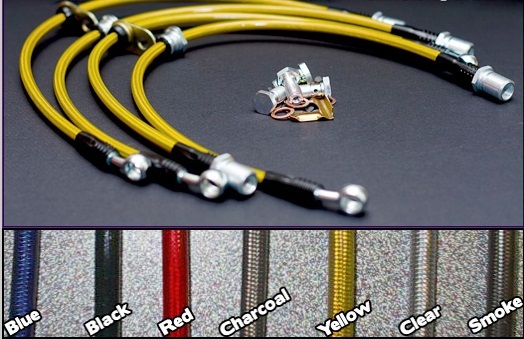 Corvette Stainless Brake Lines - Exotic Car Gear, Inc.
ExoticCarGear Stainless Steel Brake Lines for stock calipers are a significant upgrade to standard Brake Lines. Stainless Steel Brake Lines improve pedal feel and reduce the amount of time between applied pedal pressure and actual deceleration by preventing expansion, which stock rubber flex lines allow. This provides a quicker pedal response and allows the driver to maintain consistent brake pressure and precision brake modulation. 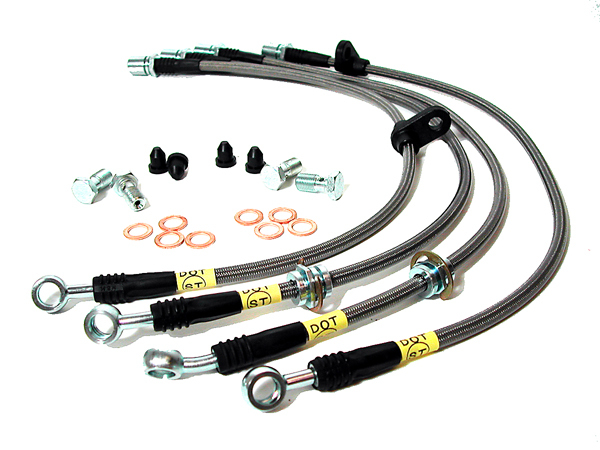 ExotcCarGear steel woven braid brake lines feature an optional clear abrasion-resistant cover for maximum protection from debris and added protection against chaffing. PVC plastic cover is available in a variety of finish colors ( Clear, Yellow, Red, Blue, Green, Smoke, and Charcoal ). The Teflon tube is very resistant to expansion under pressure and will not degrade from exposure to brake fluid. The Stainless Steel braid provides support for the Teflon and the weave is extremely durable against incidental impact and abrasion. All lines are dash 3 grade and pressure tested to 4500 psi.